Literally a Cup-cake! A gorgeous hand decorated chocolate cup filled with our signature chocolate cake and swirl of yummy white chocolate buttercream topping, finished with a chocolate decoration, choose from; a handmade chocolate rose, a chocolate 'eat me' tag or chocolate flowers and hearts. 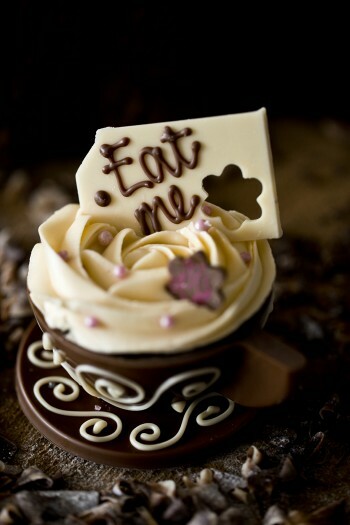 These chocolate teacups make lovely personalised gifts. We are happy to customise your order to suit you with colours and decorations; pleade contact us before you order to discuss your requirements. Milk chocolate min 33% cocoa solids, White chocolate min 29% cocoa solid: Sugar, cocoa butter, whole milk powder, emulsifier: soya lecithin, vanillin. Chocolate cake: Wheat Flour, Butter (milk), Sugar, Chocolate (min 70% cocoa solids), cocoa powder, eggs, Raising agent (Disodium disphosphate, sodium hydrogen carbonate), salt. Truffle filling: Dark Chocolate, min 53% cocoa solids, Milk Chocolate, min 33% cocoa solids: Sugar, cocoa butter, whole milk powder, emulsifier: soya lecithin vanillin. Buttercream: sugar, butter (milk), White Chocolate, Min 29% cocoa solids: Sugar, cocoa butter, whole milk powder, emulsifier: soya lecithin, vanillin.